SINGAPORE - There were 213 dengue cases reported last week, the latest figures from the National Environment Agency's (NEA) dengue website showed. This was a slight dip from the 216 cases the previous week. Another 36 cases were reported from Sunday (May 22) to 3.30pm on Monday. A total of 7,968 cases of the mosquito-borne virus have been reported this year. Four people have died from dengue this year, matching the number seen in the whole of 2015. The latest death on March 22 was that of a 73-year-old woman who lived at Poh Huat Road West. Last week, the NEA warned that Singapore had entered the traditional peak dengue season, and urged the public to sustain prevention efforts and keep the mosquito population in check. An educational portal on the dengue and Zika viruses was also launched on Sunday, giving people easy access to information on how to prevent them from spreading. As of Monday, there were a total of 55 dengue clusters, with seven classified as high-risk. 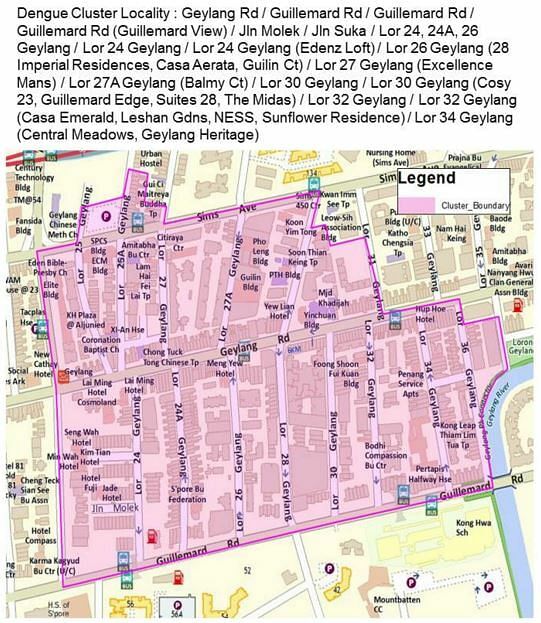 An area in Geylang was the highest risk area with 58 cases.